Note: Alternatively, the PCAN-USB Pro FD can be used, since it behaves identically concerning the CAN and LIN functionality. 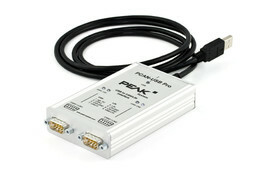 The PCAN-USB Pro adapter enables simple connection of a PC to CAN and LIN networks. Two field buses can be connected at the same time, with up to four connections available using appropriate adapter cables (2 x CAN, 2 x LIN). Its robust aluminum casing makes the PCAN-USB Pro adapter suitable for mobile applications. The monitor applications PCAN-View and PLIN-View Pro as well as the PCAN-Basic and PLIN programming interfaces are also included in the scope of supply.